Back in this post building a navigation computer, I talked about the Mac Mini that I set up to run our primary navigation software, Coastal Explorer. I used the setup for our entire trip from Boston to Florida and it worked great. Laurie even said "I like this. I don't mind using this program" when she started trying Coastal Explorer. That's a pretty good endorsement, I think. Here it is, running on the Grand Banks with one of the 24" daylight monitors. One thing I wanted to do was get the Mini running off 12VDC rather than 120VAC. Even with an inverter, 120VAC is less dependable than DC battery power. Plus, getting rid of the Mini's power supply is another step towards greater efficiency, not to mention the losses in the inverter. In the case of the Mini, I don't think it's a lot of power savings, but every bit counts. It's also nice to have one less piece of equipment (the inverter) that the navigation system depends on for operation. Now, before you go rushing off to do this yourself, a few words of caution. You will be digging into your Mini, pretty much tearing it down to its bones, cutting wires, soldering wires, then putting it all back together. Unless you are comfortable doing such things, don't try this. Or at least don't come crying to me if you mess it up. This is very much a you-are-on-your-own project. Plus, it will surely void the warranty on the Mini, so there is clear risk in undertaking this. I won't repeat the directions, but after an hour or two I had a Mini with a pig tail wire and connector hanging out of the place where the power cord used to attach. I used a locking power connector from Radio Shack so it can't accidentally get unplugged which I think is a risk with the power jack shown in the directions above. It works great, and you can't argue with the power consumption. It only draws between 1.5 and 3A @ 12VDC depending on what it's doing. Most of the time it's closer to 1.5 than 3. I turned it on when I left Gloucester, and never turned it off until we left the boat in Florida. Flawless operation the whole time. 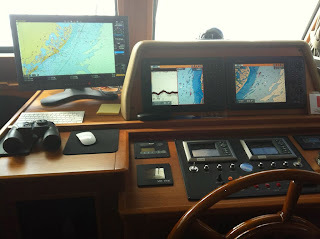 Leaving it on not only gives full access to the nav computer for route planning, weather checking, tides and current, etc, but it also serves as an anchor alarm. When not in use I just dimmed the monitor all the way down and that cuts it's power draw down to nothing as well. Then, with a quick turn of the brightness knob, it's back at full brightness anytime I need it. It's been great to be able to try out all this stuff before the new boat comes, both to confirm it works as expected, and to iron out the inevitable gotchas. So far this part has been a great success.